Regain Strong, Lifelike Teeth Seamlessly! Today, there are several options available for rebuilding lost teeth, but none are as effective or as lifelike as dental implants. At Sage Dental Care, Dr. Branco and Dr. Kim highly recommend this state-of-the-art service if your smile has been left incomplete by damage or decay. We are happy to provide the entire implant treatment process (including both surgery and restoration) right here in one convenient office location to help you remain at-ease with the team you know and trust. Contact our North Reno or South Reno, NV practice today to schedule your first consultation! Dental implants are designed to replace both the crown (the white portion) and the root of the tooth. Other treatment options only bother with the crown. A new tooth root helps to prevent the deterioration of the jawbone over time, which is better for both your oral health and your facial appearance. 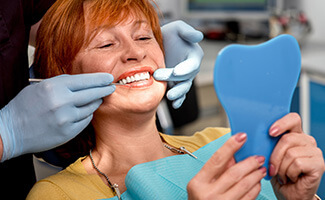 Teeth restored with dental implants function just like nature intended, and that means you can eat all your favorite foods and brush and floss like normal without restraint. In appearance, dental implants are virtually indistinguishable from the rest of your smile. You might not even be able to tell the difference between them over time. Dental implants are built to last, and they can serve patients well for 20 years, 30 years, or even the rest of your life. After our team has determined that you’re a good candidate for dental implants, the first step of treatment is the surgical placement of the implants into the jawbone. When this step is complete, you begin on a months-long healing process; during this time, your body’s natural instincts take over as the oral tissue and bone form around the implants, creating a solid foundation. Finally, it is time to return to Sage Dental Care so that we can design and place the ideal restoration on top of the implants. 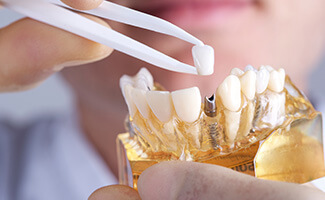 All-ceramic dental crowns are recommended for individual implants, while a customized, implant-retained bridge or denture can cover multiple implants at once in a more cost-effective manner. Keep in mind that dental implants are not exclusively for replacing individual teeth. They can easily be designed to replace multiple teeth at a time, even though they don’t have their own dedicated implant. In the case of individual tooth replacements, a single implant is used to hold one implant-retained crown. If you’re missing consecutive teeth, a bridge can be fabricated to replace three or four teeth at time while only using two implants. Instead of relying on buffed down teeth to anchor a restoration, the implants can hold a tooth on either end of the bridge. Their structure is durable enough to hold the entire restoration, therefore filling the gap in your smile. When a patient has experienced the loss of all the natural teeth along the top or bottom arch of the mouth (or both), their overall quality of life can be dramatically reduced. What’s worse is that the loss of jawbone density over time can make traditional implant treatment very difficult. Thankfully, our two Reno, NV office locations offer All-On-4 as a worthwhile alternative. Like the name implies, All-On-4 requires the placement of just four implants into the jawbone at strategic positions, which eliminates the need for costly, time-consuming grafting procedures in most cases. Better yet, an implant-retained denture can be placed on the very same day, which saves you from having to be without the strong, capable smile you need. The cost of dental implants always varies from person to person, which is why seeing a dentist for a consultation is a key part of the process. For example, the cost can vary depending on the number of implants being placed, the type of implant used and the preparatory treatments necessary to make implants viable. 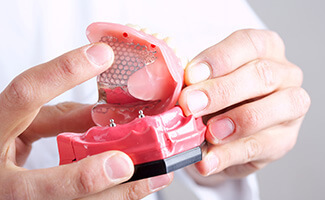 Furthermore, costs can vary depending on the abutments used, which are connectors for the restoration to the implant itself. The more complex the restoration is, the higher the cost will become as well. With that being said, dental implants are a long-term investment that is often considered the most cost-efficient solution to tooth loss, especially if you’re missing many teeth. This is because in the long-term, dental implants are easy to maintain and incredibly durable, unlike other options that don’t typically last for life.